Caroline's Content: Carrie the Limping Lion is available for pre-order! Carrie the Limping Lion is available for pre-order! Yes, you read that right! I'm so excited! I've set the release date for Monday, November 2nd. I'm self-publishing through smashwords, and I've discounted my book during the pre-order period. Two months away from the finish line! So far, you can pre-order Carrie the Limping Lion through Barnes and Noble and Kobo, and soon it will be in the Apple iBooks store, too! When you pre-order a copy of Carrie the Limping Lion, you are basically pledging to buy the book the moment that it's released. Your money won't leave your account until the release date (so if something terrible happens and I can't finish and upload the book, you won't be charged), but you'll be guaranteed the discounted price, and you'll be one of the first people in the world to read the finished book. 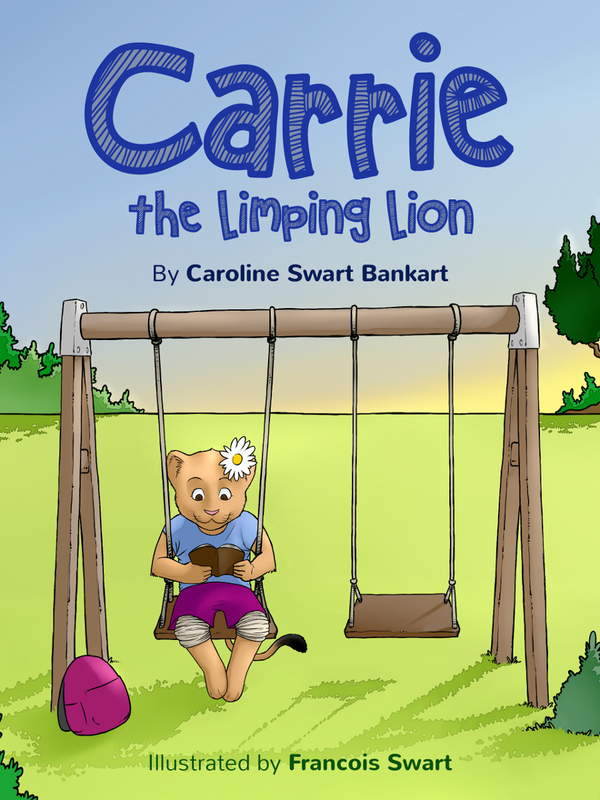 Aimed at children ages 3 to 8, Carrie the Limping Lion is a short children's poem about a lion cub who has chronic knee pain. I've also written an information section after the poem, explaining more about chronic pain and hidden illnesses in a kid-friendly way. While children with chronic pain will be able to relate to Carrie, the aim of the book is actually to educate 'normal' kids about the conditions. Hopefully, that will encourage acceptance and friendships, making the lives of the affected children a little happier. Francois is busy beautifully illustrating each of the eight stanzas, and we'll be working on the cover soon. If you'd like a sneak preview of some of the illustrations, Francois has uploaded a few unfinished versions to his Coroflot portfolio. And if you'd like to read the (probably) finished poem, I've got it right here on my blog. Just remember, you'll be looking at the process, not the finished book, which will be so much prettier. Will it be available in print? Not yet. Once the ebook has been published, though, I plan to start a crowd funding campaign to make printing a possibility. Hi Caroline, well done and all the best! We will now have two family members' books distributed through Barnes and Noble. Yours and mine! Mine more of a textbook with research on Families in Sport. My focus included Tiger Woods and the Williams tennis sisters. My author name is Jessica Knoetze-Raper. Go Girl!! !